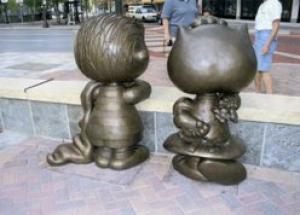 History: These statues honor the Saint Paul native, Charles Schulz. 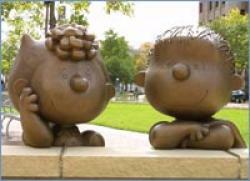 For five summers after Schulz’s death in 2000, artists all over Saint Paul designed and displayed individual renditions of Peanuts characters. Over two million people from all fifty states flocked to this tribute to Schulz. 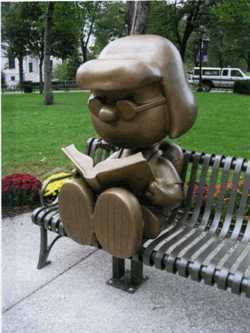 The first year featured statues of solely Snoopy, the second Charlie Brown, the third Lucy, followed by Linus, and finally Snoopy with Woodstock. 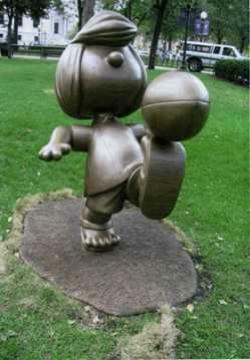 The proceeds from the past Peanut statue promotions have funded the Charles M. Schulz fund, established to create and maintain the bronze sculptures. Furthermore, the proceeds will fund scholarships for artists and cartoonists at the College of Visual Arts, the college Schulz attended and later served as an instructor. 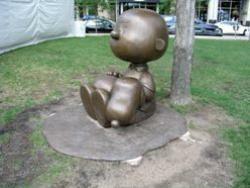 Born in 1922 in Minneapolis, Minnesota, Schulz grew up in Saint Paul. Drafted into the army in World War II, he served in Europe through 1945. When he returned to the United States, he worked for a Catholic comic magazine and taught art at Art Instruction, Inc. He also illustrated several comics other than Peanuts, but Peanuts proved the most popular. He moved to California in 1958, where he stayed until he died in 2000. Tivoli Too started in 1980, as a custom design jeweler in Saint Paul, Minnesota. 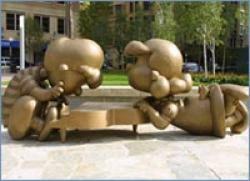 Over time, it acquired licenses to create many nationally recognized icons, and holds the only license to create Peanuts sculptures. From jewelry, Tivoli Too branched into small custom gifts and later set up a 3-D design and sculpture studio, specializing in licensed products. In the early 1990s, Tivoli Too expanded its repertoire to include custom designed large-scale pieces. For a timeline on the life of Charles M. Schulz click here.